The Liaison Office of the Central People's Government is an agency of the People’s Republic of China government tasked with the vital role of carrying out the “One Country, Two Systems” framework in the Special Administrative Regions of Hong Kong and Macao. Kaohsiung Mayor Han Kuo-yu was the first administrative chief from Taiwan to set foot in the Liaison Office. Critics claim that he set a precedent for the “One Country, Two Systems” policy; supporters counter that such an interpretation goes too far. And just three days after the conclusion of his whirlwind economic tour, PLA fighters crossed the median line of the Taiwan Strait, prompting a rebuke from the United States. 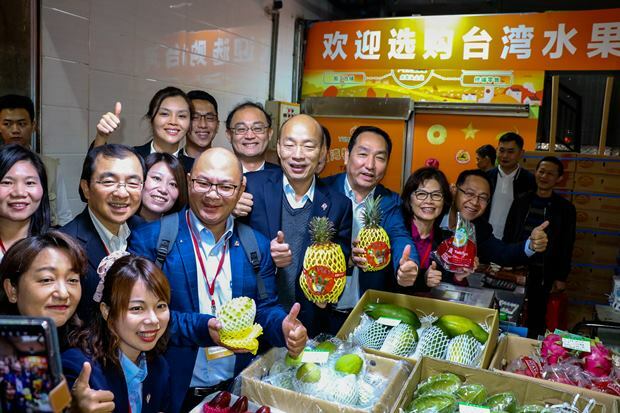 Other than efforts to promote the sales of Taiwanese fruit to China, just how has Han’s cross-strait tour reshaped relations between the U.S., Taiwan and China? The resurgence of Han, 62, from the depths of unemployment could be seen as one of the most inspirational stories in recent years. But the story does not end here. A trip to Hong Kong, Macao, and mainland China placed him squarely in the limelight, leading some to see him as a key figure in trilateral relations among the United States, Taiwan, and China. In the spring, Han first led a delegation to Singapore and Malaysia, then to Hong Kong and Macao. China was busy posturing and making moves throughout the tour, as the U.S. kept close tabs. Despite Han positioning the trip as an “economic tour,” Chinese authorities clearly did not see it that way. At Beijing’s arrangement, Han not only met with Liu Jieyi, director of the Taiwan Affairs Office, he even set foot in the Liaison Office of the Central People’s Government, becoming the first local Taiwanese administrative chief to do so. The Liaison Office is an agency of the People’s Republic of China government tasked with the vital role of overseeing the execution of the “One Country, Two Systems” framework in the Special Administrative Regions of Hong Kong and Macao. Extending Han a grand reception on the one hand, while conducting military exercises on the other, China’s two-faced strategy only made the already tense US-China relationship even dicier, serving as a warning to Taiwan. “We take this as a radical move to change the status quo,” said one U.S. official under condition of anonymity. PLA fighter jets have been more aggressive and provocative than usual, as China has taken an increasingly aggressive stance toward Taiwan, not only militarily, but in its efforts to marginalize Taiwan diplomatically. “The situation this year is incredibly similar to that of the 1996 missile crisis. And it is not beyond the realm of probability for the crisis to escalate,” opined Chao Chun-shan, president of the Foundation on Asia-Pacific Peace Studies. Tensions are only rising as the 2020 presidential election approaches. Standing at a historical crossroads, Han clearly touched a nerve in U.S.-China-Taiwan relations. Although billed as an “economic tour” in which politics was strictly avoided, it nevertheless caused considerable political controversy, even opening what could be called a new theater in the Sino-US trade war. The truth is, whether one looks to Taiwan’s Blue or Green camp interpretations, the ultimate objective points directly to the upcoming 2020 presidential election. And both Beijing and Washington are sure to play important roles to varying degrees. Focusing on economics, the newly-elected Mayor Han was not oblivious to the skepticism his visit to China could trigger. “There have been so many invitations since the election. We know full well that everyone doesn’t just see him as the mayor of Kaohsiung, yet we hoped to position the trip as a campaign to win orders for local agricultural products,” admits an aide close to Han Kuo-yu, further sharing that making Singapore and Malaysia the first stops on the tour was a calculated move to avoid controversy. Taiwan’s Bipartisan Readings: Why Visit the Liaison Office on An Economic Visit? Despite efforts to be cautious, and arranging for China to be a later stop on the tour, it nonetheless stirred significant controversy. In the final analysis, this was apparently because the Kaohsiung City Government was not in the driver’s seat. As for the question of whether the appearance at the Liaison Office had been placed on the itinerary in advance, “Mainland officials only said it was ‘possible,’ and didn’t confirm 100 percent,” stressed Yeh, noting that when it comes to dealings with Beijing, high-level official arrangements cannot be completely confirmed in advance. This also draws attention to the highly sensitive nature of anything involving the Liaison Office of the Central People's Government to the Taiwan Affairs Office, whose activities all require the approval and consent of the highest authorities in Beijing. In addition to the highly ambiguous itinerary, the content of the talks also came under significant scrutiny. In addition to Deputy Mayor Yeh, Mayor Han’s delegation of more than 30 people also included 10 city councilors, eight department or bureau chiefs, and agricultural and fishery association representatives. With the exception of meetings with the chief executives of the Hong Kong and Macao Special Administrative Regions, whose offices were too small to accommodate the entire delegation, Tsai Chin-yen, a Kaohsiung City assemblyman representing the KMT, was present throughout the entire itinerary, during which he listened closely to the dialogue. Han’s friendship tour bore rich fruit. According to the Kaohsiung City Government, from Singapore and Malaysia to China, a total of 22 contracts and 12 memoranda of understanding were reached under the “South-South cooperation” strategy, collectively valued at NT$8.4 billion in sales. “We signed long-term agreements, ranging from two to four years - not one-time deals,” explained Kaohsiung Agricultural Association Director Hsiao Han-chun. These agreements largely cover fruit, fishery products, and processed goods. “If Kaohsiung produces them, then Kaohsiung takes precedence; if not, then we look to source them from other cities and counties (in Taiwan),” Hsiao added. Orders require years to play out, but domestic concerns are real. “We had considered the possible backlash (to visiting the Liaison Office), but felt that it would consist of others labelling us without knowing what was really going on, because whether or not you set foot in the Liaison Office, the reality of Hong Kong is One Country, Two Systems,” relates Yeh Kuang-shih, his voice betraying a touch of annoyance and frustration. “It’s normal for outsiders to have reservations, but saying that visiting the Liaison Office means endorsing One Country, Two Systems is a stretch,” opines Chang Wu-yueh, director of the Cross-Strait Relations Research Center at Tamkang university, a member of the Kaohsiung City cross-strait task force, and an aide to Mayor Han on cross-strait issues, who believes the political climate in Taiwan is clear, with 80 to 90 percent of the public opposing One Country, Two Systems, hence any political figure worth his salt would never accept or endorse it. This reality is one of the largest common denominators in Taiwanese public discourse at present. According to Chang Wu-yueh, as the DPP conducts primaries for its presidential nominee, selecting someone who can lock horns with the popular Kaohsiung mayor would raise that candidate’s visibility. Of course, China’s policy toward Taiwan has always treated central and local governments differently, thus outside observers naturally hold them to different political considerations and tests. Rising US-Sino Tensions: Xi Jinping’s Warning to America? Nevertheless, behind the inter-party competition on the surface, neither the Blue nor Green camps deny that China is ratcheting up both its soft and hard line tactics towards Taiwan. “He doesn’t go with the U.S. or the cross-strait flow; rather, he places the Taiwan policy together with the two-stage goal of a revival of Chinese civilization, which must conform to his timetable,” observes Chao Chun-shan, an important policy advisor to former President Ma Ying-jeou on cross-strait relations. Lin Chuo-shui, considered a leading theorist on Taiwanese independence, holds a similar view. In the past, Beijing’s policy toward Taiwan placed hope in the Kuomintang, later learning that Taiwan affairs could not simply be settled between the KMT and the CCP, as power can change hands in popular elections in Taiwan. As for the PLA fighter planes’ “tour” of Taiwan, Lin Chuo-shui interprets this as Xi Jinping sending a warning to the United States. In contrast to the American interpretation that it is a warning to Taiwan, Lin stresses that this action is not directed merely at the Taiwanese people, but is essentially a declaration to the United States that ‘this is my power sphere.’ So, “rather than intimidating Taiwan, I’m more inclined to view it as Beijing marking its territory,” says Lin. This also signifies the full-scale rise in hostility between the PRC and the U.S., with Taiwan as a critical pawn in the game. As far as Taiwan’s 2020 presidential election goes, the U.S.’s attitude would seem to be that it supports the DPP, according to Chang Wu-yue. “Everyone knows that between Tsai Ing-wen, Han Kuo-yu, or any KMT candidate, Washington will back Tsai Ing-wen. This, we can imagine,” says Chang. In contrast, he says, Beijing favors the Blue (KMT) camp over the Green (DPP) camp. Presidential Election Path: Can Han be a ‘Blue Savior’? The image that comes up on his counterpart’s mobile phone is a keyword heat map showing possible presidential candidates for each party. William Lai’s online stature gained a big boost on March 18, concurrent with the announcement of his participation in the DPP’s party primary. Several days later, at the conclusion of his tour, Han’s profile reached a new apex on March 22, far exceeding that of other candidates such as incumbent President Tsai Ing-wen, former Premiere William Lai, Taipei Mayor Ko Wen-je, or former New Taipei City Mayor Eric Chu. Han’s meteoric rise from the depths is unprecedented in Taiwanese politics. Shouting Leninist slogans and taking Mao Zedong’s populist line, coming from the masses and taking their pulse, when it comes to promoting the economy, Han does not talk in lofty platitudes about industry, instead stressing the citizens’ economy. This has not only captured the hearts and minds of the people of Kaohsiung, it has also given the Blue camp, down in the dumps since the end of Ma Ying-jeou’s administration, newfound hope. Having turned the tables in Kaohsiung, long considered “deep Green” territory, Han has taken on imagery and iconography befitting that of a Blue camp “warrior god.” A veteran of numerous political campaigns as a candidate, Pan Heng-hsu notes that over the last nearly 30 years of KMT history, the Blue faction always looks for a “savior” to come along. Whenever the Blue camp pins its hopes on a particular candidate, it tends to create a vortex effect. This happens to be the Blue camp’s collective thinking and rules of conduct. Despite Han’s assertions that he will remain in Kaohsiung, before the time comes, no one can rule out the possibility of him running for president. “Taiwan needs internal consensus to understand the situation it faces,” opines one U.S. official. All of Taiwan’s political parties and ethnic groups need to better understand the threats and opportunities presented by China so as to maximize opportunities and minimize threats. “I’m concerned that Taiwan’s single-minded pursuit of opportunities in China will just elevate its own risks,” he added. Faced with a superpower next door and the complex international relations involved, Taiwan’s ability to walk a path of peaceful, stable relations with China while maintaining its precious freedom and democracy at the same time must be the top priority for all potential presidential candidates.